The world of Information technology has advanced furiously and daily almost billions of users invest trillions of money for development in the technology. Google is the most renounced name in the market, so every successful company wants to get affiliated with it because of its robust contribution towards advancing the technology. Android is another most prominent achievement of Google, according to the latest reports Android has become the leading Mobile Phone OS (operating system). Now being a Blogger it is getting essential to get an Android Smartphone because it does continue boundless services. Being a Blogger we need to stay updated regarding the latest trend in blogosphere obviously, we cannot sit in front of computer gazing 24 hours. 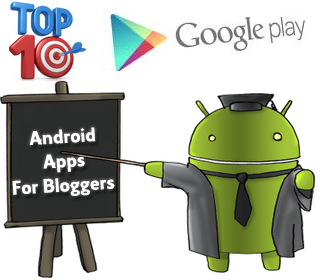 This is the reason we must consider a Smartphone, so today we will be going through the Top 10 Android Applications for Bloggers and Webmasters. Obviously we love Blogger Platform so cheers to Google for creating such a remarkable Application which can be accessed through our android Smartphone. By using this App, you can blog on the go and can enjoy the tremendous experience. It has the flexible interface, which will never let you think that you are working on a smartphone. You can easily publish posts, upload pictures and can even embed YouTube videos. Also, you can edit your list of old posts, and if you have multiple blogs setup on different accounts then you can make use of Blogger Switch account service. You can easily download this application for free from Google Play. Google Reader application is becoming necessary for every blogger because most of the time bloggers don’t like to check different blogs they want everything in systematic order in once place, so Google readers is the perfect solution. This tool will allow you to get all the updates of your Favorite Blogs, sites, and more all at once place. Google reader’s keeps on tracking the websites, so your reading listing remains updated. How can we forget WordPress it is the number one blogging platform. With the help of this WordPress Application, you can easily get access to your WordPress Admin panel and can manage your blog straight from your smartphone. WordPress for android is open souse application that allows you to write spectacular content for your visitors. This application supports both WordPress.com and WordPress.org (3.0 or higher). Do you ever imagine that how visitors came to your blog and how much time they spent on it? Google analytics is the perfect combination of SEO and website tracking tools that works solely on merits and gives most prominent results. Just few weeks ago Google has introduced Google analytics for Android devices so surly it would act as icing on the top. Usually to give an ideal touch to our Posts we need to associate a relevant image to it, so visitors can easily pick the things which you are trying to explain. Everyone knows adobe is the pioneer of photo editing, so if you want to edit images for your blog then use Adobe Photoshop Express on your Android Tablet of smartphone and I bet it will never let you down. To stay connected to your blogging circle you often use email services but Gmail is the most desirable email hosting, through which you can easily connect your different custom domain email addresses and by using GMAIL App for Android you can access them from your Smartphone or tablet. Keeps your conversation going on, everywhere you go GMAIL is there with you. Gmail is built with new and improved technology that email can be more effective, fluent, and may be funnier. Read, write, respond to your emails, and create a healthy relationship with your clients as well as followers. Search engine optimization is most crucial part of a blog it requires consistent monitoring to improve your Search engine page ranking. This App will allow you to learn whether you site is qualified to be ranked as the top most website. You can easily track and improve your website performance through SERO SERP tracker. Moreover, it’s an excellent free tool for SEO and internet marketing. Being a blogger, we have to maintain a decent relationship with our fellow blogger and Skype is the perfect platform to stay interacted with Fellow bloggers. You can talk, chat and can even go face to face using this Skype Android Application. This Application will perfectly work on Android 2.3 gingerbread, but you may experience few bugs if you try it on Android 2.2 OS. Bloggers spend almost half of their life in reading articles online, so they can get some lethal information about latest trends. However, sometime they don’t have time to search from the scratch. We can save different web pages in our smartphone and can read them anytime without any internet connection. Formally, this application was a Paid Application known as Read it later but after its success the developers renamed it to Pocket and now it’s Free for everyone. DroidEdit is an open source editor for android tables and devices which allow users to write codes straight from their mobile phones. You can easily work on several computer languages like, C++, JAVA, HTML, SQL and much more. Besides that, it is easy and takes minutes in installation. Furthermore, it provides easy to use interface through which you can easily manage different task on your fingertips. These tools are essential for every blogger who has an Android Smartphone while those who cannot afford it can easily use these tools from their desktop. Hope you have enjoyed the feast till then, peace, blessings and Happy Blogging.